CAMAS — The three practitioners who work at the newly opened Peace Yourself Together health clinic are gathered inside the sun-dappled front room of their shared Camas office, talking about what leads people down the alternative health care path. The healing mindset passed through the generations, but Lightfoot wasn’t always interested in having a career in health care. In fact, he spent much of his adult years working in human resources before giving in to the lure of alternative healing. He considered becoming a massage therapist for a while, but then he discovered the art of bio-energetic testing. 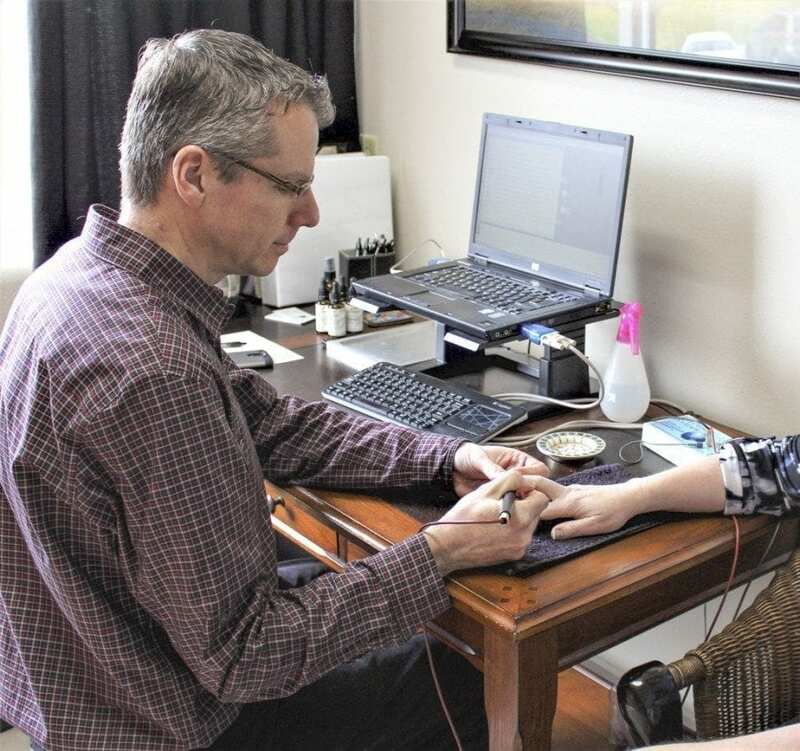 Also known as electro-dermal screening, bio-energetic testing is a process that measures the body’s energy flow and tests for various imbalances such as food allergies, vitamin or mineral deficiencies or sensitivity to heavy metals, pesticides and other chemical toxins. 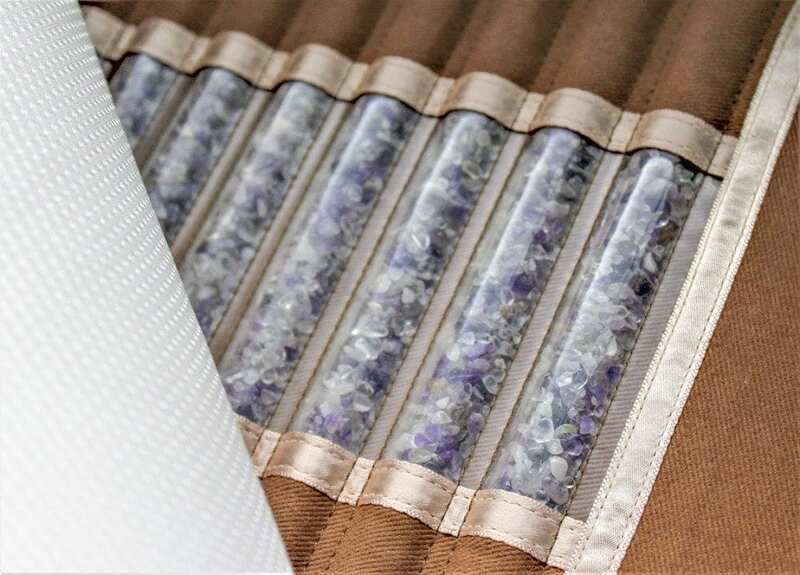 Lightfoot studied the science and technology behind the bio-energetic screening process and, after moving to the United States with his Michigan-born wife, Sarah, developed his own business as a certified electrodermal screening therapist. 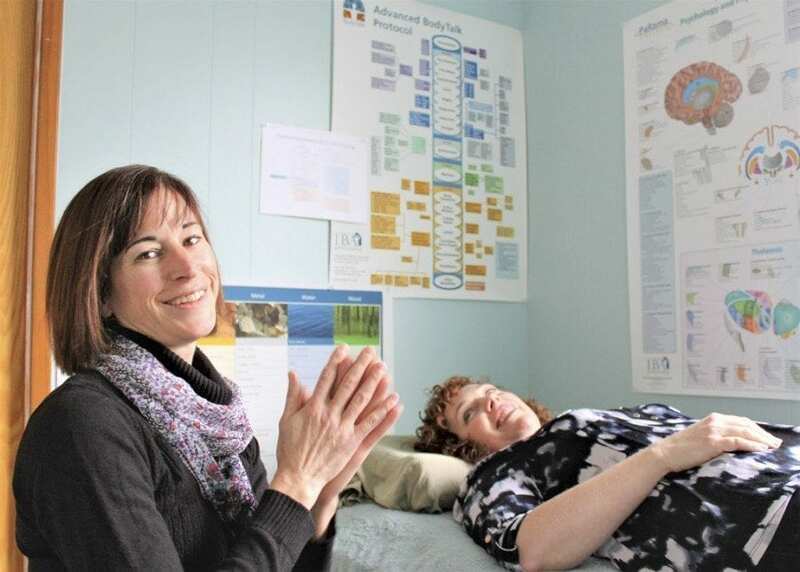 Today, the Lightfoots live in Camas with their three children, ages 6 to 18, and Lightfoot is one of three practitioners who found their way to the new Peace Yourself Together health clinic in downtown Camas. The clinic is the brainchild of Lee Huntington. Like Lightfoot, Huntington took the road less traveled in her path toward natural health care. Peace Yourself Together owner Lee Huntington, left, practices BodyTalk, a non-invasive holistic health method that stimulates the body’s innate capacity for healing, on Kimberly Telegin, at the newly opened Camas health center on Tue., Feb. 28. Video by Kelly Moyer, edited by Andi Schwartz. Recalling the first time she heard about Lightfoot’s bio-energetic screening practice — during her son’s school field trip to a local pumpkin patch where she found herself conversing with Lightfoot’s wife, Sarah, about natural healing — Huntington admits that she was a complete newbie to the world of alternative health care. Raised in a conservative, military family and coming from an engineering background, Huntington says she didn’t consider a more holistic healing approach until her own failing health forced her to look outside the confines of western medicine. “I had had chronic illness for 12 years, so I was searching for other ways,” Huntington says, describing the cascade of illnesses — thyroid cancer, Lyme disease, chronic fatigue syndrome and autoimmune disorder — that threatened her life as a formerly energetic mother of two young boys. Her breakthrough moment came in 2011, after she started seeing a BodyTalk practitioner in Portland. For Huntington, the therapy helped her heal physically as well as emotionally. Her headaches melted away and Huntington found herself getting better sleep, regaining her energy and being able to resume exercises that had, before the BodyTalk therapy, left her reeling. What’s more, she says, she realized that her life needed to change in some very major ways. She divorced her husband, started a new life as a single mother and immersed herself in becoming a holistic health practitioner. 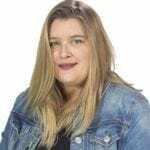 Today, Huntington is a BodyTalk practitioner, a Reiki healer and also leads Accunect workshops that focus on the body’s ability to heal through a connection of mind, body and spirit. Inside the newly opened Peace Yourself Together clinic, Huntington has set up two mild hyperbaric oxygen chambers for clients to use in one-hour increments to relieve inflammation and assist the body’s healing process. The chambers inflate to expose people to increased atmospheric pressure, helping to better oxygenate the body thus reducing inflammation and promoting healing, Huntington says. Inside, she has added LED lights, which clients can place directly over or under the areas that need more direct attention. 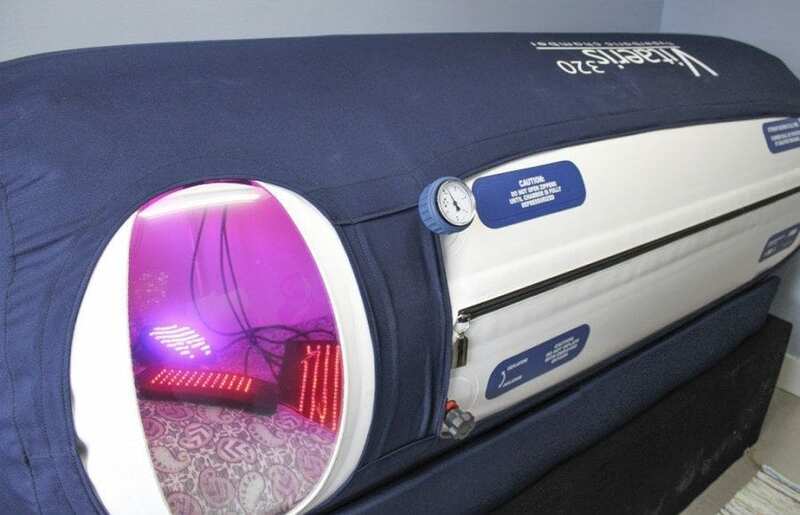 With a price tag of about $25,000 each, the mild hyperbaric oxygen chambers are traditionally used by people like professional athletes and others who can afford to buy a chamber for personal use. But Huntington says she wanted to provide the Camas-Washougal community with a more cost-effective way to experience the healing benefits of mild hyperbaric oxygen therapy. Peace Yourself Together clients can purchase packages of chamber treatments and Huntington will soon offer a sort of do-it-yourself monthly membership, which will provide clients access to a range of healing modalities at the Camas clinic, including the mild hyperbaric oxygen chambers and the amethyst-laced BioMat that uses far infrared light to speed healing, reduce inflammation and alleviate stress. For clients hoping to heal on a deeper, more emotional level, Kimberly Telegin, the third Peace Yourself Together practitioner, offers a therapy known as Retracing Sequence Method. Described as a Christian neuro-emotional therapy, the Retracing Sequence Method (RSM) is, as Telegin explains it, is a way of understanding how our deepest emotions can manifest as disease. With a master’s degree in family and human development, Telegin says she became drawn to the holistic therapy after becoming a mother of five children, three of whom are adopted and had some underlying health issues that RSM helped alleviate. Bringing the mind-body-spirit therapy to Peace Yourself Together seemed like a natural fit, Telegin says. The three practitioners often refer clients to each other for therapies that might help in their overall healing. “The different therapies complement each other,” Huntington says. As for Lightfoot, he says the therapists all represent various aspects of the mind-body-spirit healing that is so critical to finding overall, “whole” health. The new holistic health clinic will host an open house from 5 to 8 p.m., Fri., March 3, in conjunction with the Camas First Friday “Go Green!” event. To learn more, visit the clinic at 506 N.E. Everett St., near the Camas Library, or go to the clinic’s in-progress website at www.peaceyourselftogether.net. To reach Lightfoot directly, call (360) 836-4852 for his office phone or 503-421-0658 for his cell phone, or email him at timothy.lightfoot@gmail.com. To reach Telegin, call (360) 852-0199 or email her at kimberlytelegin.rsm@gmail.com. To reach Huntington, call or text (360) 601-3196 or email her at peaceyourselftogether@gmail.com.